Making sure you have the correct compressor for your tyre fitting machine can be a right headache! Especially if you don’t understand what you are looking for! At Tyre Bay Direct we like to make things as easy as possible, making sure you understand and find the right products first time. Of course if you still feel confused just call us on 01580 883 580 and speak to Ant, our resident equipment expert! For more detailed information on these areas, visit our Compressor Knowledge Base article where a detailed breakdown is supplied! 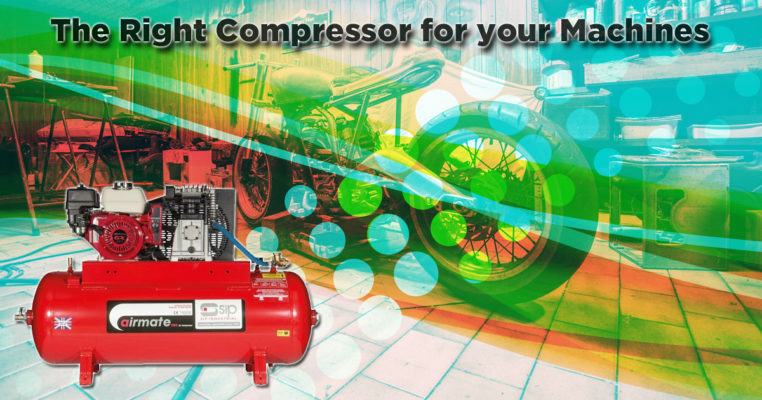 Again for a more detailed breakdown on these types of air compressors, our Types of Compressor article is the place to head (we didn’t want to bore you too much on one page!). Obviously you can’t purchase an air compressor that is too big for your workshop or isn’t practical for your current processes! What if you want to put it on your mobile tyre fitting van for example? Will it echo around an enclosed space? Is it close to an area you deal with customers? Will it disrupt other businesses in the area? By considering what we have discussed already, you should be able to eliminate certain air compressors from your search. Take a look at our extensive range of air compressors now and call our experts today on 01527 883580 to order the right compressor for your equipment at the best price first time! This entry was posted in Garage Equipment and tagged Compressor, Garage Equipment. What equipment do I need for Motorcycle tyre changing?